Pair-Matched™ hinge leaves so our hinges fit your door better. Lifetime lubrication for quiet performance with no maintenance. Anodizing after machining to deliver superior wear and durability. Stringent manufacturing process controls and rigid attention to craftsmanship in design enables SELECT to provide you with a hinge that exceeded 25,000,000 open/close cycles in independent tests -- more than most doors will ever see in 60+ years of daily performance. Durability is definitely GREEN. The independent testing enables us to confidently offer you the industry's only Continuous Warranty. If a properly installed SELECT hinge ever fails for any reason, we will replace the hinge for FREE. EVERY SELECT Geared Continuous Hinge is made from recycled aluminum. The recycling, long product life cycle and reduced waste (avoiding discarded replacement hinges) help your building qualify for U.S.G.B.C. LEED points. This website lets you download a copy of our Continuous Warranty, specification and dimension sheets, complete installation instructions, and descriptive literature that fully explains the significant benefits of a truly sustainable hinge - the SELECT Geared Continuous Hinge. 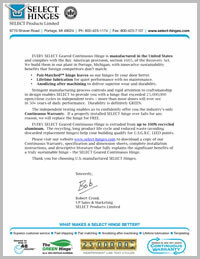 Thank you for choosing U.S.-manufactured SELECT Hinges.